I love movies. When I was a little kid and my mom and I loved going to theater to see double features. For those of you too young to remember, double features were once the norm. For the price of a single admission (about $1.50 in the late '60s) you got to watch not one, but TWO movies. You see, back in the olden days, there was only one screen in a movie theater. That's right. Just one. No multi-plexes. No sixteen movies to choose from. Just that one screen with two movies that showed one right after the other. I have so many great movie memories. 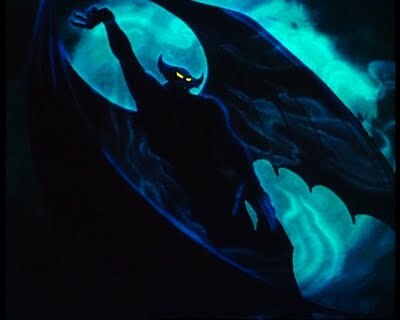 There was the re-release of Fantasia, which charmed me with little dancing Chinese mushrooms, but sent me crawling under under my seat during the Night on Bald Mountain sequence. Seriously... look at this picture... who wouldn't that scare? Every Easter we would walk across the street to the Pantages theater and watch King of Kings. The 1927, black and white, Cecil B. DeMille silent movie version. This movie impressed me for three reasons: (1) Mary Magdalene's bad-girl outfit was positively scandalous, (2) you had to read all the dialogue, and (2) after the resurrection of Jesus, the movie was colorized. It was a muted, pastel-ish kind of color, but it still amazed me. It was almost like The Wizard of Oz in reverse. But one movie experience stands out above them all. It was at a park that had outdoor movies during the summer. We were supposed to see Flubber that night, but the movie was changed at the last minute. 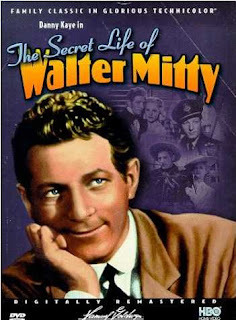 Instead, a park representative said, we would be watching something called The Secret Life of Walter Mitty. I was a little worried... what kind of movie would it be? Since I'd gone with friends, I was trapped there. But then the movie began, and Danny Kaye came on the screen. To the best of my knowledge, this was the first time I'd ever seen Mr. Kaye, but I was immediately taken by this quick-tongued, rubber-bodied comedic master. And now, we're finally getting to the part where I tie this post in to the theme... DVDing. The Secret Life of Walter Mitty became one of my favorite movies. Whenever it came on TV (and it seemed to come on a lot), I watched it. Naturally, this is a movie I want to own and share with my own child. Only problem is, you can't get it anymore. Yes, you can find used VHS tapes on eBay, and if you want to spend a couple hundred bucks, you can get a DVD. And it looks like you can watch most of the movie in bits and pieces on YouTube. But you can't bop on over to Amazon and purchase a new copy for $19.99. I've done all kinds of internet searches, trying to find why the movie isn't readily available. Is there some kind of rights dispute? Something with the Thurber estate, perhaps? (The original short story was written by James Thurber, although Walter in the movie bears little resemblance to Thurber's Walter. In fact, Hollywood legend has it that the author offered Sam Goldwyn $10,000 not to make the movie.) But I haven't come up with an answer. So, if any of you fabulous, in-the-know folks out there know the scoop about Walter Mitty, I'd love to hear it! How about you? Is there a movie you adore, watch over and over, but don't own? What's your story? Jen, I'm sorry but no one will know this answer because it's . . . well, it's a secret. I didn't go to many movies as a child, despite the fact that my mother grew up in a 'city' (I grew up in the country) and lived across the street from the movie theater. The projectionist literally called over to them, as they sat on their upstairs balcony porch, when the movie was about to start. But movies for me were rare. I do recall The Incredible Mr. Limpet in particular. It made quite an impression on me. Did you see it? So, it seems our only way to see Danny Kaye's classic is to catch it on a movie channel. What a shame. Do you have any stories to share, about growing up in the center of 'movie' land? I loved Thurber's version, but I don't think I've ever seen the movie version all the way through. Seems like I've caught it a couple times when it was already in progress on TV. But now I want to see it. Hmm. Maybe I'll put on my Nancy Drew hat and go sleuthing. I will just point out that Danny Kaye is also in White Christmas. He was a great actor and dancer. Deb, I remember the Incredible Mr. Limpet. It's with Don Knotts isn't it? Part cartoon? Yes, that's the one, Lisa. Maybe I remember it so much because it was one of the few times I went to the movies. Perhaps it was the drive-in? I remember reading The Secret Life of Walter Mitty in high school! I loved the short story. The Incredible Mr. Limpet. Ah yes, another childhood favorite. Don Knotts is a nerdy little man who gazes in the water saying, "I wish, I wish, I wish I was a fish." And he becomes one (which is the animated part of the movie). I never saw this movie, Jen. But I do remember double features and the cartoons before each movie. What happened to the cartoons? I know there was a movie I love but can't find on DVD--but it's been so long I've forgotten which one it was! One of the first movies I ever remember seeing in the theatre (we didn't go often), was Disney's Candleshoe with Jody Foster. Haven't thought of that one in years! Suzie, I DO rember cartoons before the movies. Pixar runs shorts before each of their movies now. In fact, you can buy a whole DVD that's nothing but the shorts, which are awesome! I love old movies. 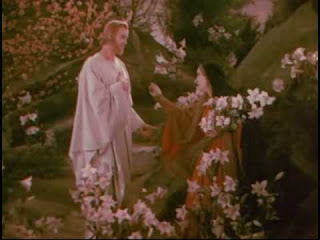 Some of my favorites are the musicals like Brigadoon. I love the fantasy element of slipping away magically and being able to change everything with love. Oh sigh :-) But The Incredible Mr. Limpet? Oh YES! That one and the Ghost and Mr. Chicken and the whole series that Don Knotts did I'd watch over and over still. Classic Disney, my whole family loves it. One old movie I finally watched as an adult had Sean Connery in it. I was so terrified as a child it gave me nightmares. Darby O'Gill and the Little People. The banshee haunted me for years! I thought it was funny that when I later saw it as an adult, my stomach clenched. It surprised me that the memory was so strong to create that kind of reaction. My mom says the pink elephants song in Dumbo scared me when I was little. Now it's my favorite part! I love Danny Kaye in White Christmas. And Hans Christian Andersen. He was a good dramatic actor too, in The Five Pennies. He's a trumpet player whose daughter becomes ill (with polio I think) and he quits playing to get a real job so he can keep her and pay the doctors. It's a real tearjerker and he's fantastic!